I’ve lived with depression for most of my life. It kicked into overdrive afterthe death of one of my dearest friends. My life went from coming together to completely falling apart in a matter of months. Shortly after my loss, I caught the flu from my mom while caring for her. I lost my car due to financial distress, and my income was basically non-existent. I felt like I was in a vortex of darkness and was slipping deeper and deeper each day. My thoughts were erratic and sometimes suicidal. I was at the end of my rope and ready to try anything! I decided to try therapy. I needed to reclaim my sanity, my peace, and my life. After a few sessions, I started to feel a little more connected to life. I still felt disconnected from, myself, my goals, and my ability to dream. About a month ago, my best friend casually says, “I have something for you.” She went on to say, “I bought if for myself, but I’m pretty happy. I think it was really meant for you.” I thought to myself, “Goodness! Is my unhappiness that obvious?” I reluctantly agreed to accept the mysterious gift. The gift I received was The Happiness Planner. Next to friendship, it has been one of the greatest gifts I’ve ever received. 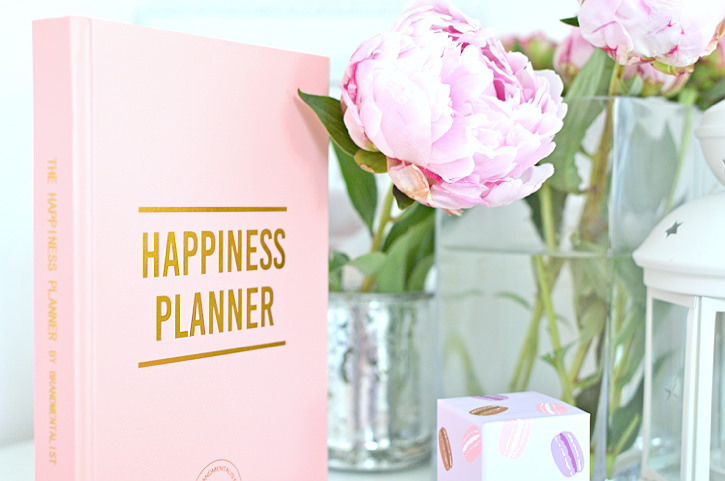 The pink cover glistened with gold lettering “The Happiness Planner”. Before even opening the book, just the thought of its possibilities excited me! I remember taking a deep breath, and thinking, “I have a lot of work cut out for me, but I’m ready.” At first glance, I was a little intimidated by the probing questionnaires. Questions like, “What makes you happy?” and “What makes you unhappy?” are things I never really thought about. You spend your life saying you want to be happy, but rarely ask yourself what makes you happy. After about a week of deep self-reflection, I felt like I was meeting myself for the first time. I had 100 days of self-discovery ahead of me, full of unlimited possibilities. In the Happiness Planner, each week presents an opportunity to live with intention. Every day is a new chance to choose what inspires you and set goals accordingly. The applications of the book allowed me to become the organized person I always knew I was. I’m no longer trapped in the messy prison death grip depression had on me. In just a little over a month, I’ve maintained a clean environment, become prompt and aware of time. Also, I have never been so creative in my life. I’m excited to see what the next 70 days have in store. I’m so happy that you are on this journey. I know you to be a beautiful person inside and out. Continue your journey. It will inspire others and allow people to confess their unhappiness, but with hope that it will end. Hi! Thank you for sharing your story as so many hide in the shadows of depression. Please continue to share your journey and self-care tools as it will serve so many.